In May we will be reading a review of Tate Triennial 3 (2006) by Brian Sewell. This session will be chaired by Richard Lloyd-Jones. DOWNLOAD: Sewell, Brian (2012/2006). Tate Triennial III. In Naked Emperors: Criticisms of English Contemporary Art. London: Quartet Books, pp. 101-105. Originally published Evening Standard March 10, 2006. 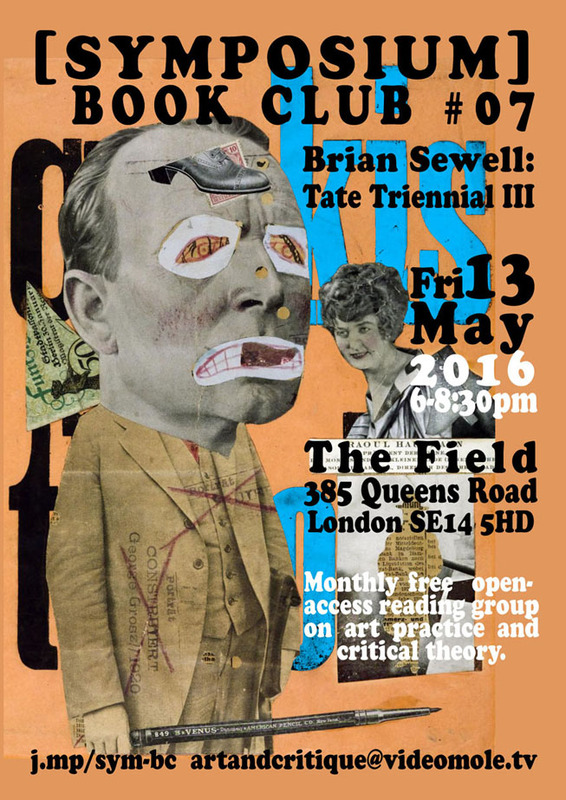 [SYMPOSIUM] BOOK CLUB #7 Sewell: Tate Triennial III, Friday 13 May 2016, 6:00-8:30pm. Brian Sewell recently died, aged 84 and until the last year of his life he wrote a weekly column in the Evening Standard. He was famous for his trenchant views on the art world and he was often very amusing. But – is a popular critique of art and exhibitions worth anything? Can such articles only amuse the reader and advertise popular exhibitions or do they have validity in contextualising the historical importance of the art? BS was at the epicentre of the debates about ‘public art’. He felt that the value of real artistic achievement was undermined by the development of ‘popular’ exhibitions, in particular at the Tate Galleries dominated by Sir Nicholas Serota and his acolytes, which Sewell called ‘the Serota Tendency’. Should national institutions aim solely at improving the quality of works in the collection or should they aim to reflect the art world today and popularise galleries with cafes shops and ‘outreach’ programmes? Did his scholarship give him the right to condemn some modern art – in particular conceptual art? Did his avowed prejudices, in particular his misogyny, invalidate his views on art in general? Is the new breed of curator becoming more influential than the academic?